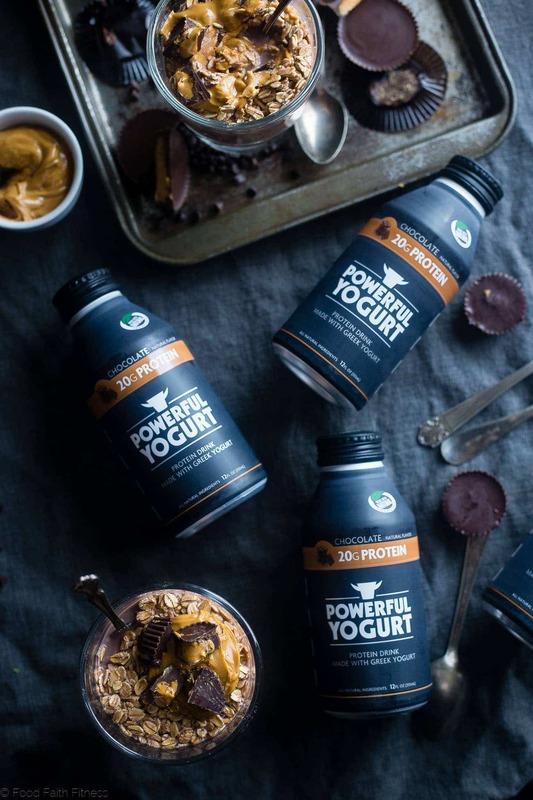 Just wanted you to pop in and letchu know that your newest protein-packed breakfast obsession is sponsored by my friends over at Powerful Yogurt! I told you that you wouldn’t be mad. We’re BASICALLY talking about all of your breakfast dreams coming TRUE in bowl-of-oatmeal-form. It eating peanut butter and chocolate for breakfast (hi healthy high protein french toast, we like you too!) is wrong, then I do not WANT TO BE RIGHT. How Long Can You Keep Overnight Oats In The Fridge? I’ve made oats that last for up to a week in the fridge! It really depends on what you put in them. Things like fresh fruit go bad quicker, so those are best eaten within 2 or 3 days of making them! Other reasons you need to mind me (besides the fact that I hold the recipe-keys to majorly delicious-real-food breakfast GOALS in the form of this overnight oatmeal recipe) are because I want to introduce you to a young company, that has seen a HYOOGE expansion in the past four years: Powerful Yogurt! I know. Total run-on sentence. But you know me…run-on sentences are basically the love language of my soul. But, really. Have you ever HEARD of a protein drink with a Greek yogurt base? I am totally THAT girl who used to always bring a container of the stuff in my purse, and then whip it out – spoon and all – at the most awkward of times in public places. Don’t lie. You’ve been the “Greek Yogurt Girl” too. Well, my muscle-building loving internet BFFS, we no longer have to turn on ninja-stealth mode when trying to make our protein portable – The Powerful Yogurt Drink just solved this very real-life problem. I’m pretty sure you guys know how I feel about dessert-flavored overnight oatmeal. Judging by the fact that we’ve bonded over a few bowls of cookie dough overnight oats, funfetti protein overnight oats, strawberry cheesecake overnight oats and gluten free cinnamon roll overnight oats, you know it’s TRU LOVE. I also just really dig peanut butter with oatmeal. 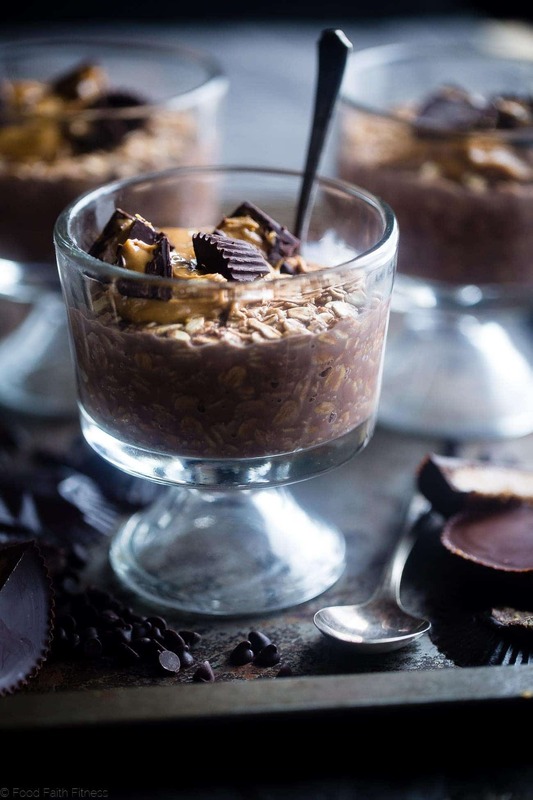 Peanut butter, oatmeal and chocolate or even a Banana Peanut Butter Overnight Oats Recipe with Almond Milk. It’s all just SO GOOD. ANDDDD, because I know that your mouths crave the VERY SAME things, I’m making a HIGHLY educated guess that you’re right on the board the oatmeal-love-train. Especially when chocolate and peanut butter are involved. 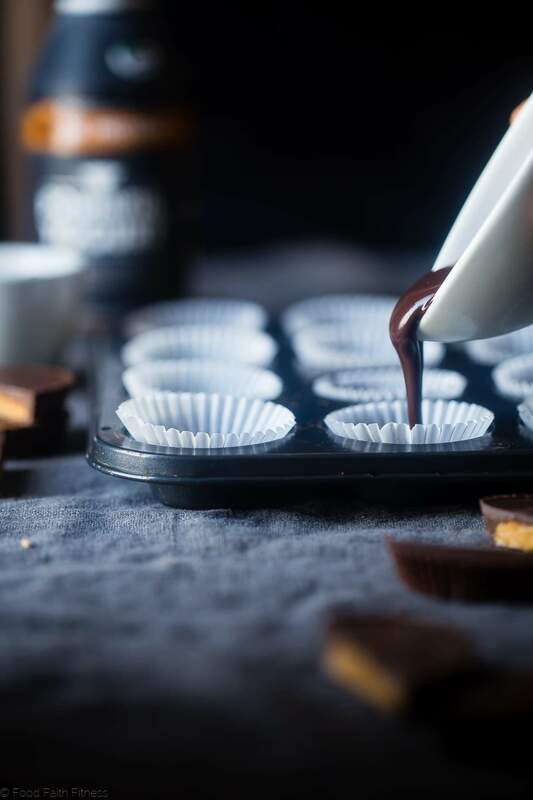 Did we mention HOMEMADE PEANUT BUTTER CUPS? I know, we did. Can’t help it. Obsessing. Just imagine with me, if you will, this moment: you wake up still sleepy-eyed and HANGRY. Not-able-to-think-yet-you forgets that, not only did you ALREADY MAKE BREAKFAST the night before (look at you being prepared!) you made a breakfast that is ALL real food and is jamming to the tune of gonna-keep-you-full-until-lunch healthy carbs and protein. 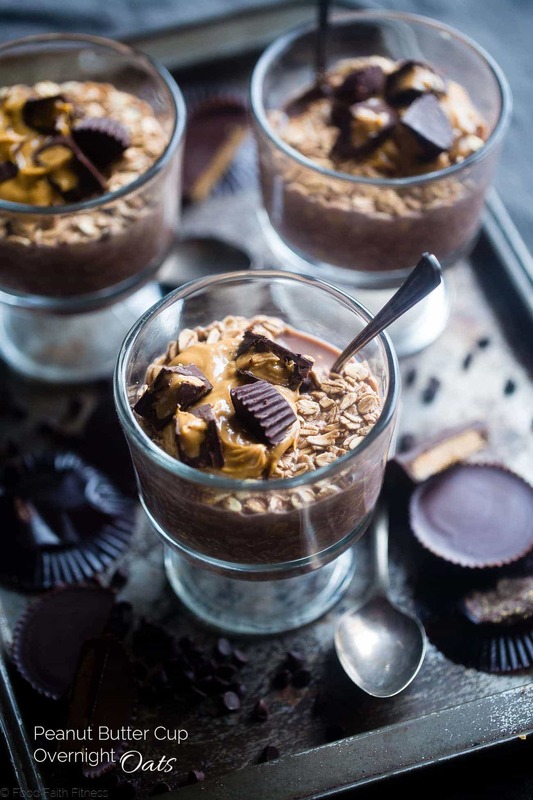 With a sweet burst of crispy-crunchy chocolate cups that are hugging rich, creamy peanut butter. Can you imagine what morning you feels like when you REMEMBER all of that is ready and W-A-I-T-I-N-G? That kinda happy life CAN BE YOURS MY FRIEND. Reach out and grab the spoon. 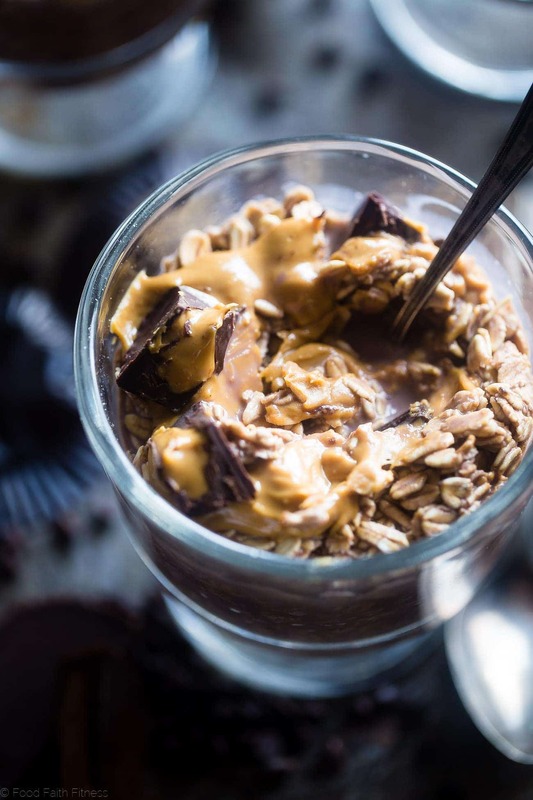 These chocolate peanut butter overnight oats with yogurt are topped with homemade peanut butter cups! They're an easy, healthy, gluten free and protein-packed make-ahead breakfast! In a medium bowl, stir together the oats and peanut butter powder. 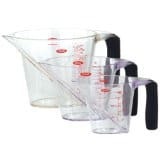 Divide evenly between 2 cups. In a large liquid measuring cup, combine The Powerful Yogurt Drink and honey. Microwave just for 10-15 seconds until the honey melts. Be carefully not to cook too long, or you'll cook the yogurt. Whisk together until the honey is dissolved in the yogurt. Divide the yogurt/honey mixture evenly between the 2 cups. Place into the refrigerator and chill at least 6 hours - overnight. In a medium, microwave-safe bowl using half power and 30 second cooking intervals, melt the chocolate chips until smooth and melted. 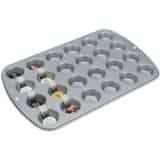 Place two mini muffin liners into 2 mini muffin pan cavities. Pour a small amount of melted chocolate into the bottom and smooth out. 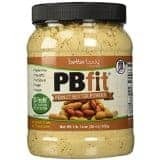 Divide 1 Tbsp of the peanut butter between each cavity, leaving space around the side. Place in the freezer until set, about 30 minutes. Once set, re-warm the chocolate chips to melt them. Then, fill up the muffin liners so that the peanut butter is covered. Place into the freezer to set while the oats set. Once the oats have sat long enough, chop up the peanut butter cups and divide them between the cups. Finally, drizzle with the remaining peanut butter. THIS POST IS SPONSORED BY MY FRIENDS AT POWERFUL YOGURT. THANK YOU FOR ALLOWING ME TO CONTINUE CREATING GREAT CONTENT FOR YOU BY SUPPORTING PARTNERSHIPS WITH SUPER-FAB BRANDS THAT FOOD FAITH FITNESS LOVES TO WORK WITH! AS ALWAYS, OPINIONS REMAIN 100% MY OWN! This is all the flavors I want in my breakfast. Looks tasty and easy enough. Plus you just can’t beat being ahead of the game with making it the night before! Dreamy creamy dessert-wanna-be for breakfast – yeeeaaaahhhh! This chocoliscious peanut buter cuo goodness needs to get in ma belly! HOLLAAA!!! Taylor – you crack me up – thanks for the am laugh – happy Monday sweet friend! OMG, Taylor! This I must try. Powerful Yogurt… good stuff! It IS good! Thanks Suzy! Drooling over here! 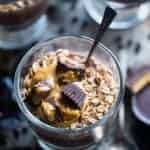 I’ve made overnight chocolate peanut butter oats and peanut butter cups and a million combos but never peanut butter cups in my overnight oats! The only time I think I’ve had peanut butter cups for breakfast would be traveling. This is so genius and seems so wrong but oh so right! Cannot wait to make these. GIRL. You NEEED to combine them – so good!!! I hope you love! Um, this is pretty much the most mind blowing breakfast I’ve EVER seen…and I love the idea of making oatmeal with a yogurt drink ~ you are a genius! What an amazingly delicious and decadent breakfast! Who wouldn’t want to start off their day with this?! I am always down with chocolate and peanut butter! Oh my goodness! These overnight oats look straight-up DECADENT. I absolutely have to make these tonight so I can eat them in the morning. Yum! You SO do! You would love them girl! Thanks! Ooo, oo! These oats can definitely brighten up a Monday! When you say peanut butter cups, I mean, come on! Love it! RIGHT?! Who can’t love PB cups! You can NEVER go wrong with dessert for breakfast! Especially when it’s protein packed! I 100% agree! The best way to start the day! I love a breakfast that could double as dessert!! Nothing better than starting your day with a little peanut butter chocolate!! I TOTALLY agree! Thanks Jenn! This recipe is easily all of my breakfast dreams come true!! ???????? I love the chocolate and peanut butter combo. 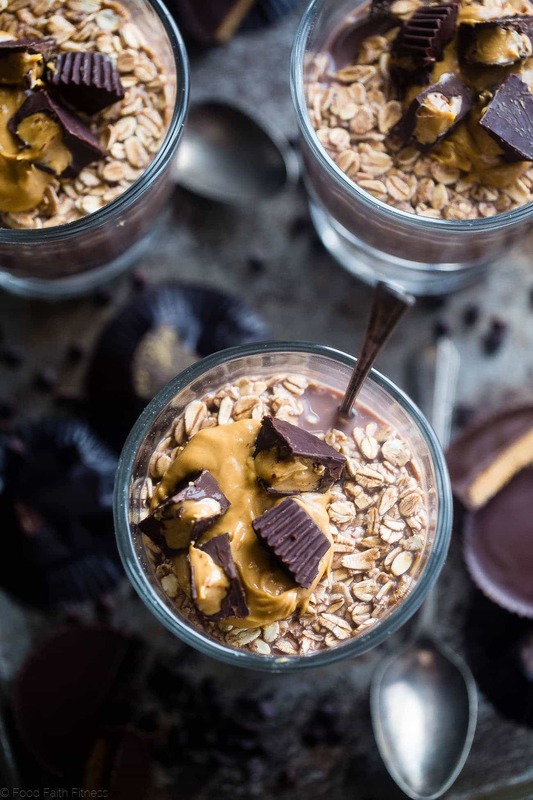 I’m all for a healthy breakfast with peanut butter cups! Yum! Haha I know 😉 Don’t hate! Thanks Alisa! This looks so delicious! Great recipe!! No matter what side of the bed I wake up on having this for breakfast will make it an amazing day! I love waking up to breakfast especially when it will taste like a dessert! You and me both! Dessert for breakfast is the besssst! Well this is one fabulous way to start the day! Taylor this recipe is outstanding. Healthy yet packed with all the decadent foods too. I love it. That’s not the breakfast! That’s the DESSERT hahah This overnight oats looks really amazing Taylor! 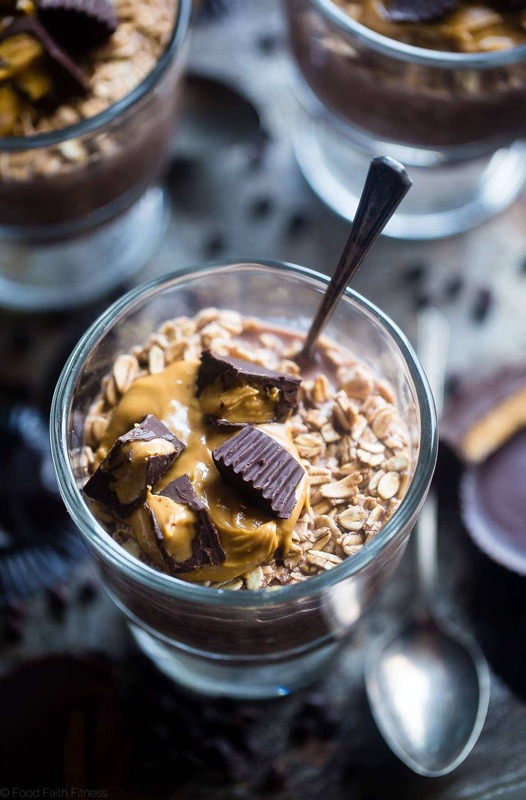 I’m a huge fan of oats.. and the chocolate… and PB 😀 So this is like dreamy breakfast for me. We are FOOD twins! 🙂 Thanks Natalie! I am trying this one. I love peanut butter and who doesn’t like chocolate. YUM!!!!! You would love it! Thank you! I have totally been that yogurt girl. I need to try these drinks and this recipe! 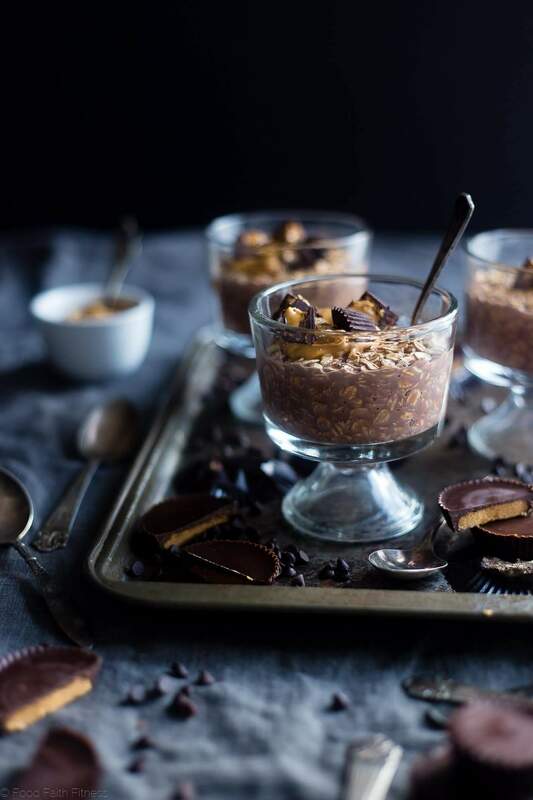 Oats, PB, yogurt and chocolate. So many of my faves. Thanks for sharing! Haha YES, I knew I wasn’t along! Hope you love!